We stayed in an apartment on the outskirts of Hanover, but it was a really bad experience so I'm not even gonna post the link or pictures. Definitely NOT family friendly as advertised. Anyway, rant over, now onto beautiful Hamburg! Hamburg is Germany's second-largest city, the richest judged by per-capita income, and its most important port. It's the biggest city in the European Union that's not a capital and has a special pride. Hamburg is popular with German tourists who come here to enjoy Broadway-style musicals, eat fish, watch soccer games, marvel at its mighty port, and experience the nightlife of the Reeperbahn. American tourists are pretty rare. Like many port towns Hamburg can have rough edges, but it is a memorable city. Hamburg lacks a quaint medieval center. Bombing destroyed about a third of the city in WWII, but what really leveled Hamburg's atmospheric old town was a huge fire in 1842. Today the city center with almost no pre-1850 buildings still standing is a mix of office buildings and brand-name chain shops. We started our time right in the heart of the city near the City Hall. A lovely canal runs nearby with a colonnaded shopping center along it. Hamburg has delightful lakes, two of them, that started out as one big lake that formed with townsfolk built a mill that dammed the Alster River. During the Thirty Years' War, however, the city fortified itself behind a defensive wall that split the millpond in two. Along the shore of the smaller lake, the Binnenalster, is the headquarters of Hamburg's most important shipping company, Hapag-Lloyd. The waterside Jungfernsteig street is the city's most elegant promenade and home to its top-of-the-line shops. These include Germany's biggest Apple store. We enjoyed the sunshine as we walked under the colonnade by the canal. Looking back towards the City Hall. Hamburg's impressive 647-room Rathaus was completed in 1897. The previous City Hall had burned down in the fire of 1842 and the new building was meant to showcase the wealth and grandeur of turn-of-the-20th-century imperial Germany. The country was a newcomer among European nations and, psychologically, it needed to legitimize itself by celebrating its supposed deep roots. The City Hall shows off Neo-Renaissance, Neo-Gothic, and other then-popular historicist styles. Hamburg forms its own state within the Federal Republic of Germany and the council that meets in the City Hall chambers is also like a state legislature. Berlin and Bremen are the other two German cities with semi-autonomous status. Hamburg has more bridges than Amsterdam and Venice combined! Statue of a prominent Hamburger. St. Michael's church is Hamburg's best known church. Locals call it simply "der Michel." The building was completely rebuilt after a fire in 1906 which was started by workers repairing the roof. The interior is bright and wide with decoration that is unusually ornate for a Protestant church. The church has fine acoustics with a special channel that brings the organ's sound through an ornate, latticed grate in the ceiling. An opera singer was performing as we walked through, it was quite lovely. As usual, I huffed it up the tower for views! Looking out towards the Elbe river. Looking back towards the City Hall. Just behind the church is the Krameramstwohnungen, a collection of half-timbered buildings along a narrow lane. These are rare 17-century Hamburg survivors. 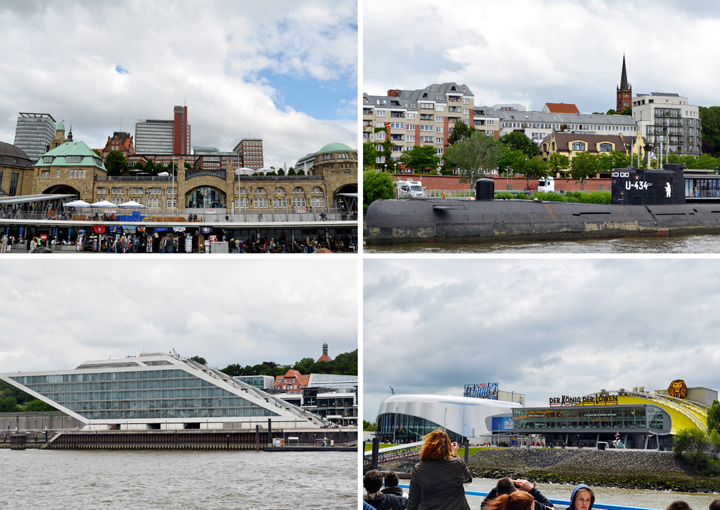 Our next stop was down to the St. Pauli Landungsbrücken Harborfront. Rick Steves recommended taking a boat tour of the river and commercial port with Rainer Abicht, the only company that offers an English-narrated tour. The English tour is only offered once-a-day at 12:00 noon so we had lunch at a little place on the docks then loaded up on the boat. Some early sights from our cruise. See the building on the bottom-left? It was designed to look like a luxury yacht. Hamburg has so much renovation and redevelopment happening. They are turning these cool old warehouse buildings into hipster apartments and the like. Hamburg has a massive commercial shipping port. It was fascinating to see the huge container ships being loaded and unloaded with cargo from all over the world. 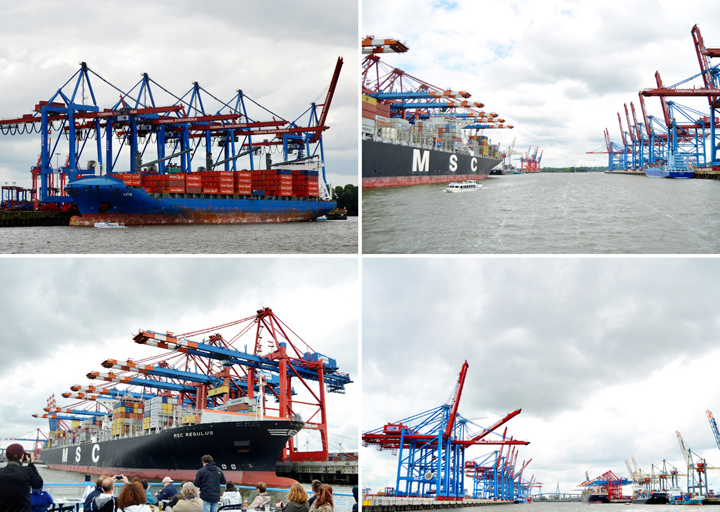 Hamburg is the second largest port in Europe after Rotterdam in the Netherlands and the 15th largest in the world. Looking back towards Hamburg as we turned around and headed back upstream. Hamburg from the Elbe River. The spire is St. Michael's. 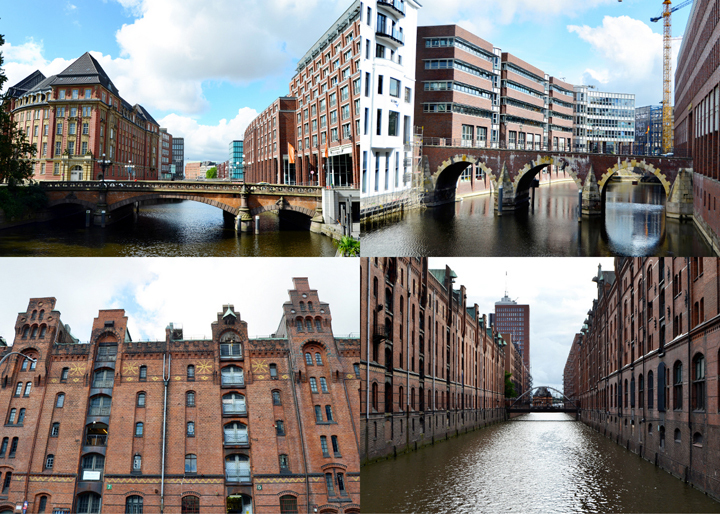 Upstream is the HafenCity and Speicherstadt area of town. It's Europe's biggest urban development project and when it's done it'll make the city center 40% bigger. The centerpiece of the development is the Elbphilharmonie Concert Hall. It's a jaw-dropping structure that promised to become a symbol of modern Germany. It's a combination concert hall, hotel, apartment complex, and shopping mall, all contained in a towering and beautiful piece of architecture. It has ended up costing about four times as much as was originally planned. Back on shore we admired the light-brown former terminal building, now filled with shops, with its appropriately grandiose tower meant to evoke the ancient lighthouse in Alexandria, Egypt. At this point we were bushed, so we navigated the metro back to our car parked near the city hall. 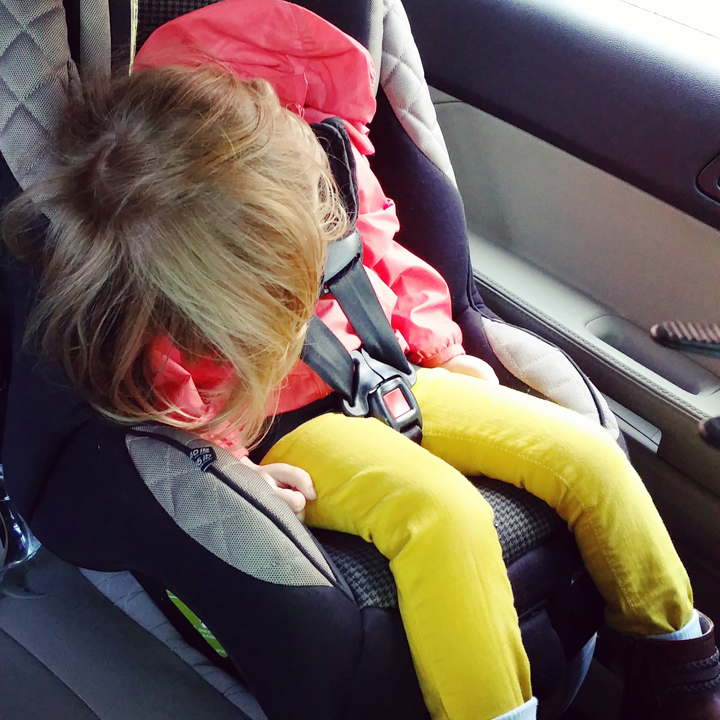 On the 10 minute drive back to the apartment to take naps Janey fell asleep. And that concludes our nap time for the day. We rested and grabbed some food before loading up again in the car and driving back down into the Speicherstadt district. We found some free street parking and went off in search of the view of Hamburg. Along the way we admired the cool architecture of this "ware-house city" (the meaning of speicherstadt). This area was originally built over a 40-year span starting in the late 1880s as a place to store goods customs-free. But with the advent of modern container terminals across the river it no longer made sense to store goods here. Nevertheless the city decided to renovate the area and preserve the warehouses as part of the urban landscape. Then we found it! The view of Hamburg I was searching for! Pink sun flare and others gathered around admiring the view. More lovely architecture in this area. I love all the brick. 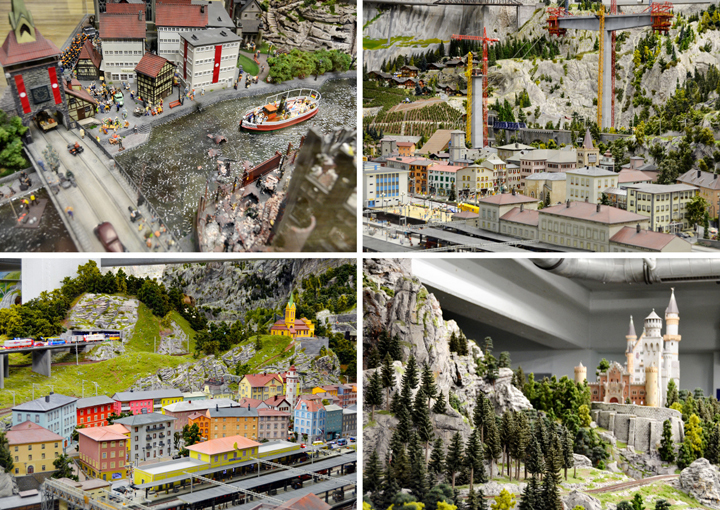 One of the attractions that has come to this up-and-coming area is Miniatur Wunderland - home to the world's largest model railway. My dad had sent me a YouTube video about this awhile ago and I knew we had to see it! Fox in front of a case displaying some of the various cars, train cars, etc, from the model railway. He was sooooo stinkin' happy! Cool little dioramas showing the history of a typical German town. Right at kids' eye level. The attraction is constantly expanding. This huge area is going to be Italy-themed. We loved this place. Chris and I might have liked it even more than the kids! Spread across two floors and 12,000 square feet you can visit the Alps in Switzerland and Austria, see Bavarian castles, explore Hamburg's city center, catch the great sights of America including Vegas and Yosemite, and travel to Scandinavia. Even in miniature I love colorful buildings! Every 15 minutes the lights change and nightfalls so you get to see all the panoramas lit up. It was fun to experience an accelerated sunset. Perhaps the most fascinating area is the model airport. Planes land and take off, taxi to gates, and little luggage cars buzz around. We caught a Lufthansa plane taking off! The control center where half the guys were half asleep lol. View from where we ate dinner. Our family in Hamburg on Saturday June 20th 2015. Thanks for the wunder scheon TOUR of Hamburg. I had a brief overnight stay when I was in Hamburg years ago. All I did was to visit a friend and see the St. Michel Church...love love your trip to the miniature museum! Another amazing post, Paige! Hands down, the train place was the coolest part! I loved it!